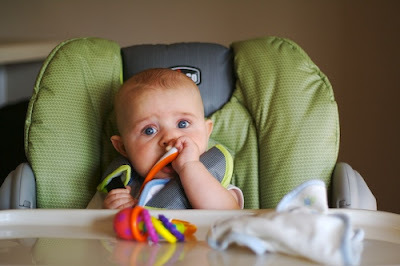 We still aren't ready for solid foods yet, but we are trying out the highchair to get him comfy in it. 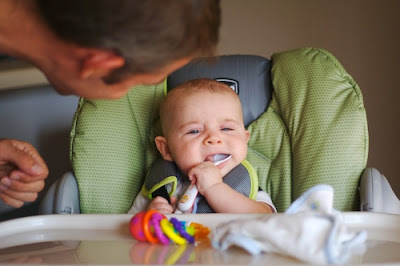 I read in a book that one of the ways to see if babies are ready for solid food is to see how they react to a spoon in their mouth. So no food yet, but here's the reaction to the spoon. Yep, it definitely goes in my mouth but somethings not quite right. Ok, I feel kind of stupid saying "Where's the beef" past the year 1985, but hey, I'm a nerd. So forgive me. 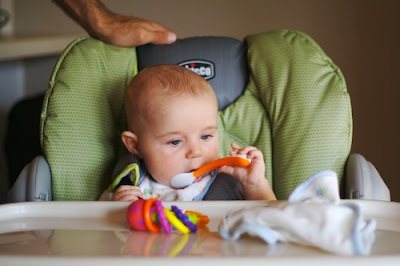 We are excited to start solids soon, but honestly, there's no need to start them quite yet. Our pediatrician said that as long as he is still sleeping well and through the night that he's still getting all the calories he needs. 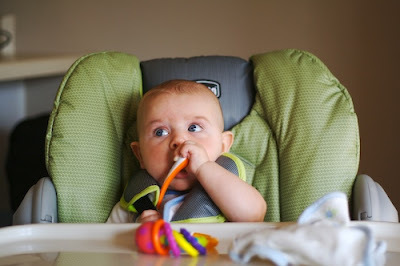 I'm thrilled with that because as much fun as I'm sure it will be to feed him solids, breastfeeding is so easy, cheap, transportable and makes him happy.